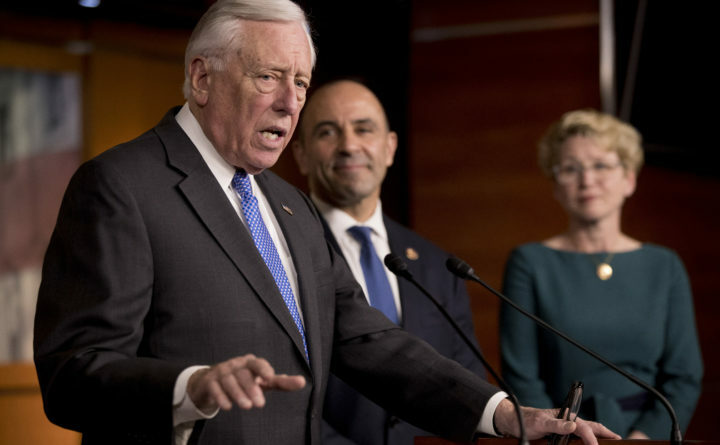 House Majority Leader Steny Hoyer of Maryland, left, accompanied by Rep. Jimmy Panetta, D-California, center, and Rep. Chrissy Houlahan, D-Pennsylvania, right, speaks at a news conference to introduce legislation supporting NATO on Capitol Hill in Washington on Tuesday. WASHINGTON — The House of Representatives resoundingly passed a bipartisan measure Tuesday to prohibit the Trump administration from using federal funds to pull the United States out of NATO, rebuking the president for his frequent attacks against the strategic alliance and suggesting he might seek to withdraw. The vast majority of House Republicans joined Democrats to pass the bill by a vote of 357 to 22, after members of both parties gave impassioned speeches for why the alliance was so vital to preserve and protect. Yet members of the two parties differed in how sharply they were willing to directly chide Trump as they voiced support for the measure. The bill endorses the 2014 Wales Defense Investment Pledge, under which NATO countries said they would endeavor “to reverse the trend of declining defense budgets” and ensure that every member spends 2 percent of their national income on defense capabilities that could be called upon in support of NATO. Trump has frequently mischaracterized the pledge, alleging NATO members “owe” the United States and have been “delinquent” for years. House Republicans backing Tuesday’s measure pointed to the bill’s support for the 2014 declaration — and the subsequent efforts of NATO countries to ratchet up their defense spending — as a positive, without directly addressing the president’s claims. But Democrats were more blunt about framing their support for the measure as a rejection of Trump’s stance — and a warning to him not to escalate his political standoff with NATO any further.